There was three inches of fresh snow on the ground as our team of four headed north on NM-14 towards Paa ‘ko Village to start our Christmas Bird Count route. The trees just south of the entrance were alive with birds, and we stopped to tally them. 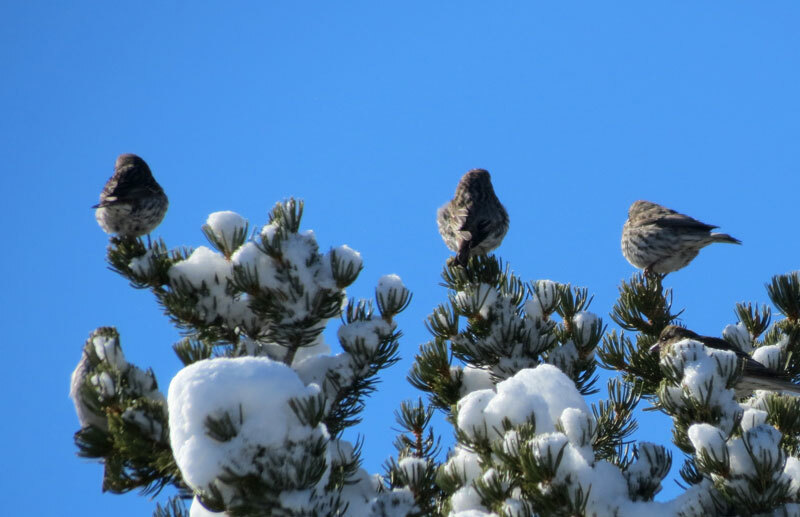 What a surprise to discover they were all Cassin’s Finches – 38. I had never seen so many congregated together before. They would not be our last Cassin’s. We spent over 3 hours in the development, adding more Cassin’s Finches each time we stopped to count – 127 by time we left the area! While we normally find a number of Townsend’s Solitaires, we didn’t spot a single one. Among a tree full of Western Bluebirds, we saw a Cedar Waxwing and 3 American Goldfinches during a snow shower. There weren’t as many Dark-eyed Juncos; however, the American Robins were plentiful. After lunch back in Sandia Park, where we compared notes with several other teams as they showed up, we proceeded along the rest of the route. 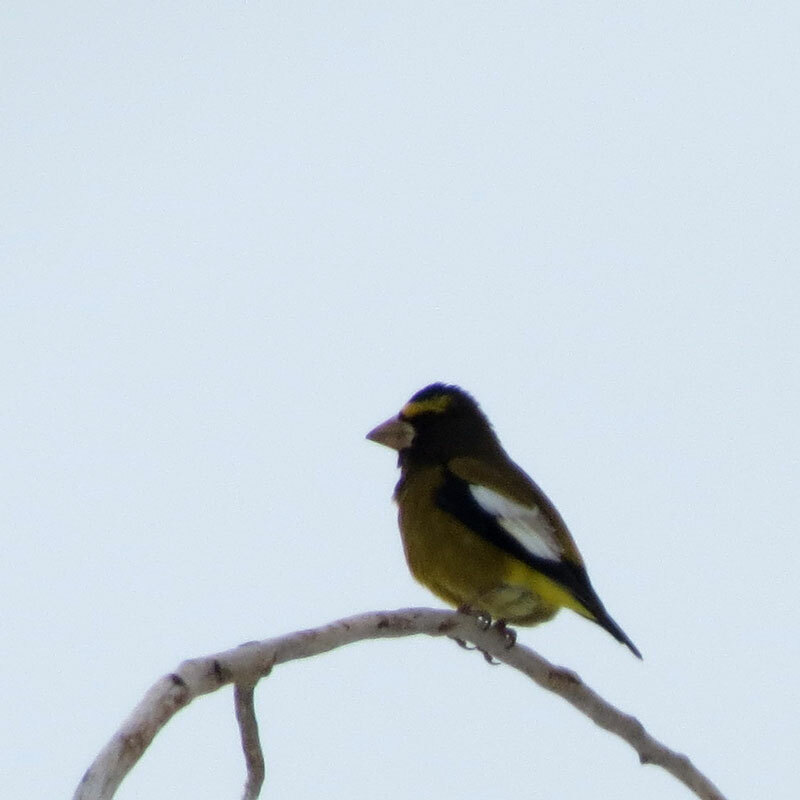 Along Harms Rd., Debbie noticed a female Evening Grosbeak among a tree full of House Sparrows. 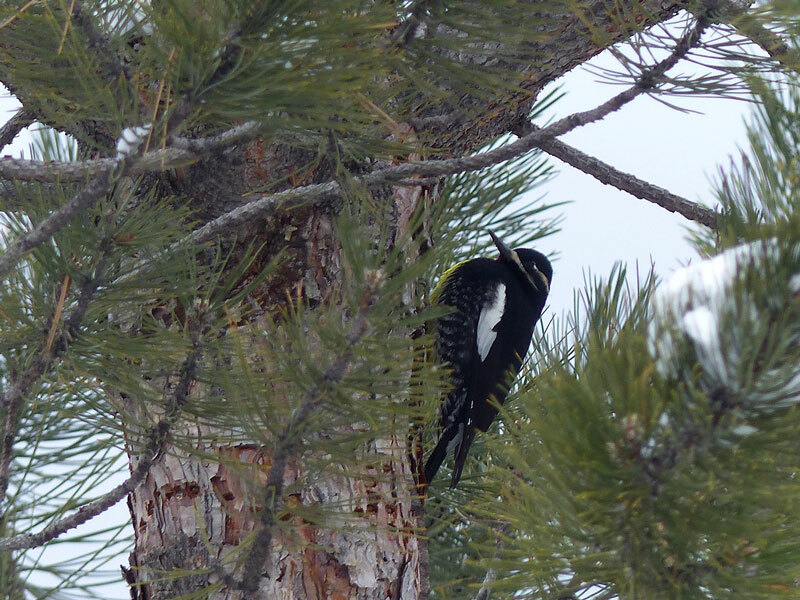 “There is a large woodpecker in that ponderosa,” Debbie alerted us – ever the eagle-eye. It was a male Williamson’s Sapsucker! “I have never seen its yellow belly before,” she exclaimed. Next we started scouting the roads south of Frost Road. “Stop, there is a bird in the top of the tree on our right,” I signaled. Another lone Evening Grosbeak – this one a male. It started to snow again. 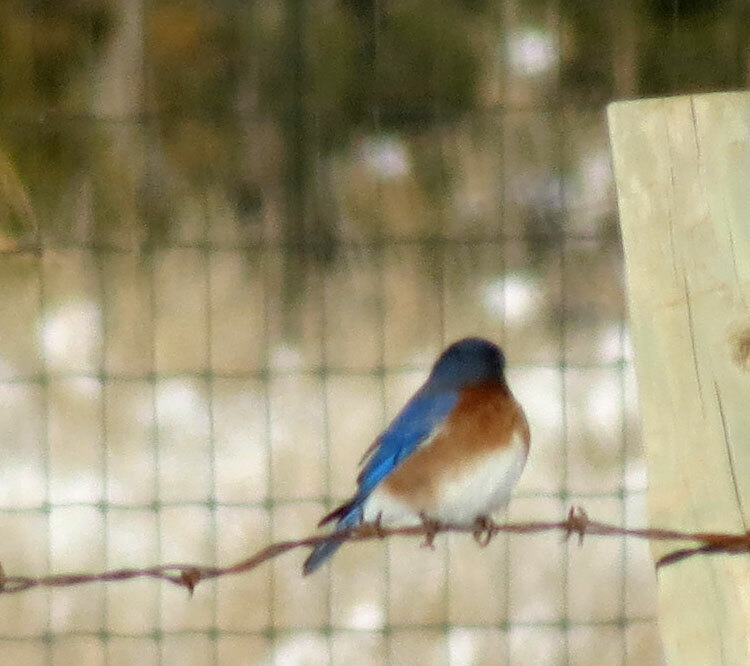 We were surprised to see Mountain Bluebirds in this area – normally they are much further east. We didn’t spot our first Red-tailed Hawk of the day until the turn-around spot along Gutierrez Canyon Road. 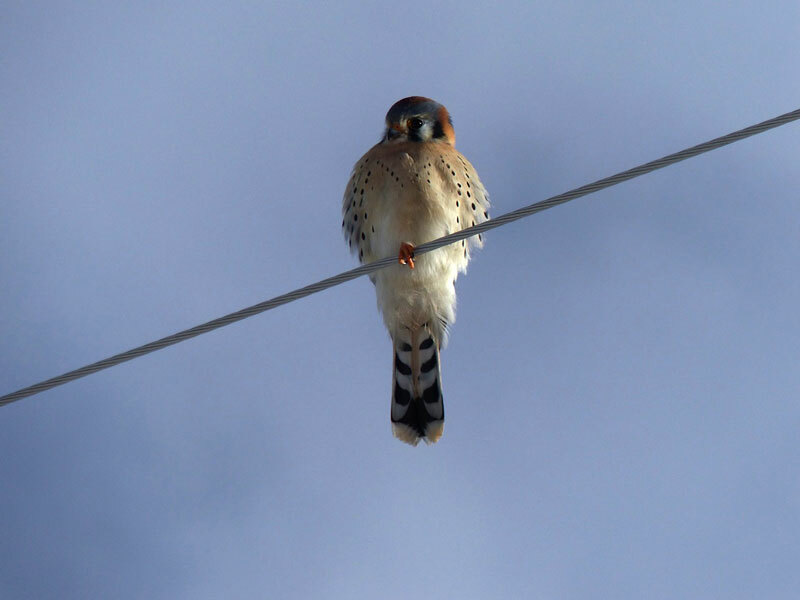 It had stopped snowing and the sun was shining by time we started exploring the roads north of Frost Road, we saw our first American Kestrel of the day – and Debbie was able to capture a photo of it. 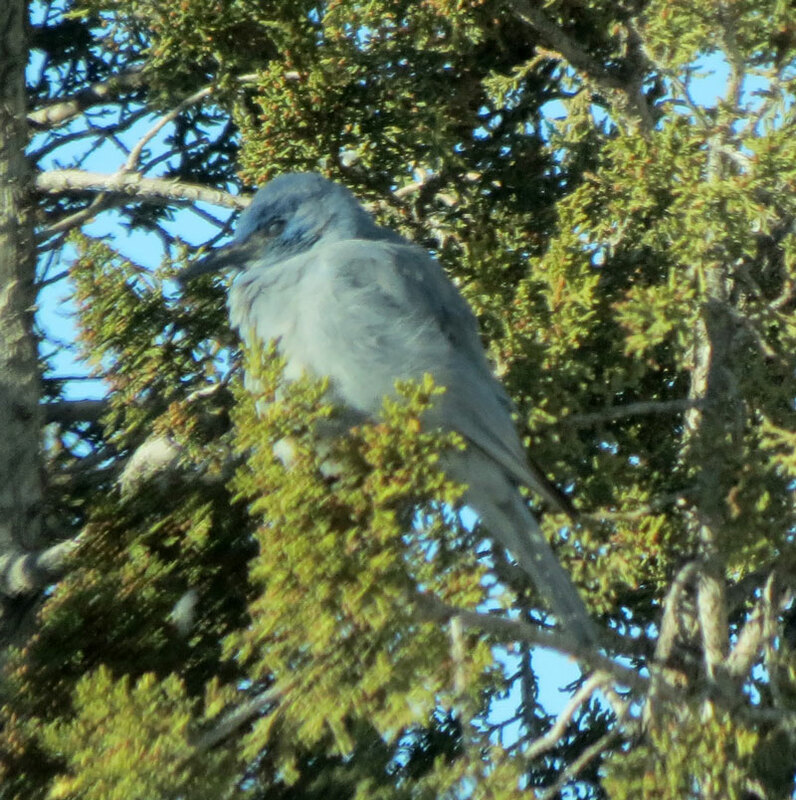 Along Stagecoach Junction Road, we stopped as birds darted in and out of the trees along the road – Pinyon Jays! “Let’s open the windows,” Barb suggested – and we enjoyed their raucous calls. They appeared to be having fun! It was getting late in the afternoon as we headed along Solar Lane. At the end of the road we stopped and got out of the car to watch a feeding frenzy as birds were getting ready for the long cold night. We were amazed to find four Eastern Bluebirds among the Westerns – rare for this count area. 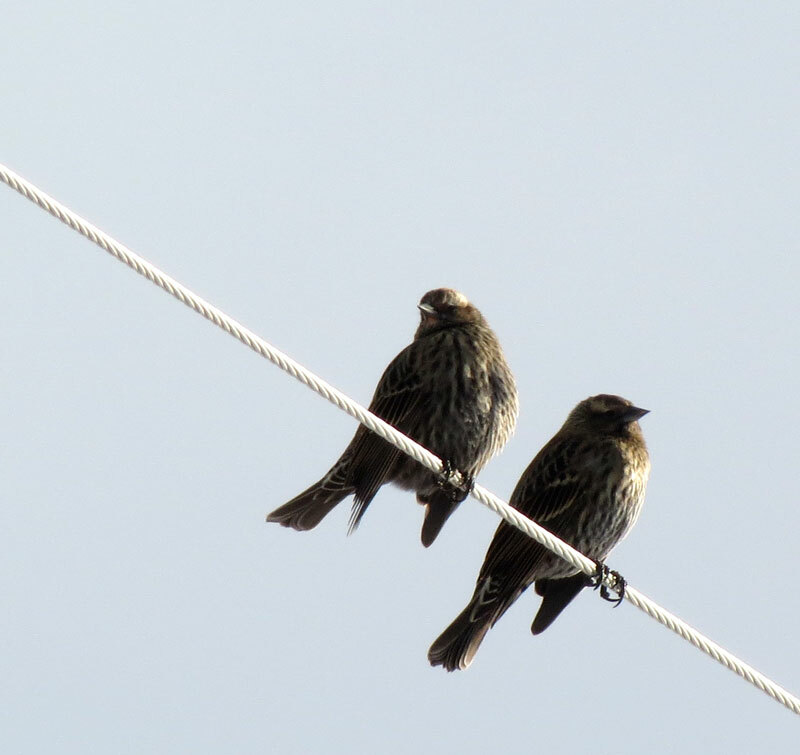 Another surprise was a flock of 13 female Red-winged Blackbirds – also rare for this count area. We ended the day shortly after 4:00 – just time to get back to Albuquerque and join the other teams for the compilation gathering. It had been a delightful day of birding with good friends. We were grateful to Barbara for her skillful driving on snowy roads. Cassin’s Finches certainly dominated the day with 131 seen overall.